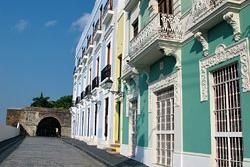 Old San Juan dating back 500 years, is a lively city of adoquine block streets bordered by 16th and 17th century buildings, hightliting the beautiful Spanish architecture of that era. 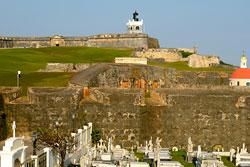 Old San Juan is an exciting combination of history, art, great food, shopping and music. 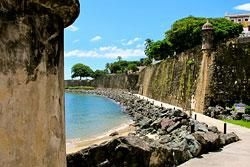 Viejo San Juan is best seen on foot so bring some comfortable walking shoes and cool tropical clothing. A good idea would be to book a tour with one of the many tour operators offering services in the Old City. 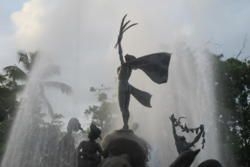 For tours that include food tasting Spoon Food Tours and Flavors of San Juan are good choices, in addition Legends of Puerto Rico offers interesting walking and night tours by very knowledgeable guides. Without a doubt one of the main attractions of the old city are the 3 main forts that protected the inhabitants from foreign invaders. Castillo San Felipe de Morro a national historic site rises majestically over the entrance to San Juan Bay. Completed in 1589 the fortification is a series of tunnels, ramps, barracks, dungeons and sentry boxes called 'garitas'. Castillo de San Cristóbal completed in 1771 and is also a national historic site. This impressive structure with its massive walls and 5 independent levels connected by moats and tunnels was designed to both defend and intimidate the enemy. Both fortifications are run by the National Parks Service and are open to the public daily from 9:00am to 6:00pm except on Thanksgiving Day, Christmas Day and New Year’s Day. Entrance fees are $3.00 per fort $5.00 for both. Children 15 and under are free. 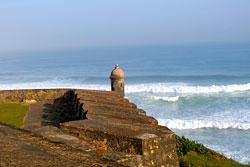 (787) 729-6777 Fuerte San Gerónimo was built on the eastern end of the city as added protection. It is located behind the Caribe Hilton hotel in Puerta de Tierra. Archtours runs some fun and interesting tours of the forts and architecture of the old city. In the tradition of Spanish towns, Old San Juan has several plazas the oldest being Plaza San José located on Calle San Sebastian it is surrounded by some of the oldest structures in the city, and a favorite meeting place for locals. Other notables are Plaza de Armas on Calle San Francisco, planned as San Juan's main square, once used as a military parade ground. On the North side of the plaza is the Alcaldía, San Juan’s City Hall on the Southside there is a large building that once housed Gonzalez Padín a famous but now defunct department store it is home to a Marshall’s discount store now. This plaza is ringed with benches, a great place to enjoy a cup of coffee that you can buy at a kiosk or take a nice evening stroll. Plaza Dársenas located outside the city walls near the beautiful Paseo La Princesa and adjacent to the cruiseship piers is a lively place loaded with food and souvenir vendors. On Saturday nights seniors gather to play dominoes and dance to live music. Paseo La Princesa the location of the Puerto Rico Tourism Company is a beautiful tree lined street that ends with the Raices Fountain at the harbors edge. Paseo La Princesa is also the location of a quaint outdoor play area for children. Plaza Colón just south of Castillo de San Cristóbal and a short walk from the cruise ship ports. Plaza Colón is on the site of one of the original gated entries into the Old City, many artisan fairs, art exhibitions and musical concerts are held here. On the Southside of the plaza is Teatro Tapia; built around 1824 it is more than likely the oldest freestanding drama building still in use in the United States. Several fine eateries border the plaza; try Café Puerto Rico for some great Puerto Rican cuisine. Other points of interest are the Parque de las Palomas overlooking the harbor where you can feed the hundreds of pigeons that await visitors. 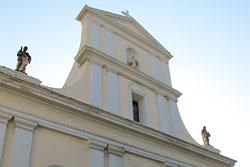 The Catedral de San Juan located on Cristo Street and rebuilt in 1540 after the original structure was destroyed by a hurricane is the second oldest cathedral in the western hemisphere. The tomb of Juan Ponce de León and the body of the martyr St. Pío are on display here. If you are not staying there it is worth a visit to the El Convento Hotel situated just to the Northwest of the cathedral, the hotel building is a converted convent with beautiful hallways and inner courtyard. La Fortaleza located at the top of Fortaleza Streed is home of Puerto Rico’s Governor and the oldest executive mansion in continuous use in the hemisphere. La Fortaleza is open from 9:00am to 3:00pm and admission is free. (787) 721-7000 ext. 2211. El Capitolio is the Capital Building housing the offices of Puerto Rico's senators and representatives. The building is located just to the east of the Castillo de San Cristóbal between Avenida Muñoz Rivera and Avenida Ponce de León. The Constitution of the Commonwealth of Puerto Rico is on display in the rotunda. Tours are by appointment and admission is free. Monday – Friday 9:00am to 4:00pm (787) 721-6040. Walk the streets, take a guided tour or jump on the trolley and explore! Take in the beauty of the architecture, step into the many art galleries, museums and shops. After you work up an appetite, dine at any of the fine restaurants particularly along Calle Fortaleza nicknamed SoFo. A couple of recommendations are Barrachina Old San Juan located at 104 Calle Fortaleza home of the original Piña Colada and for some great mofongo Punto de Vista atop the Hotel Milano.